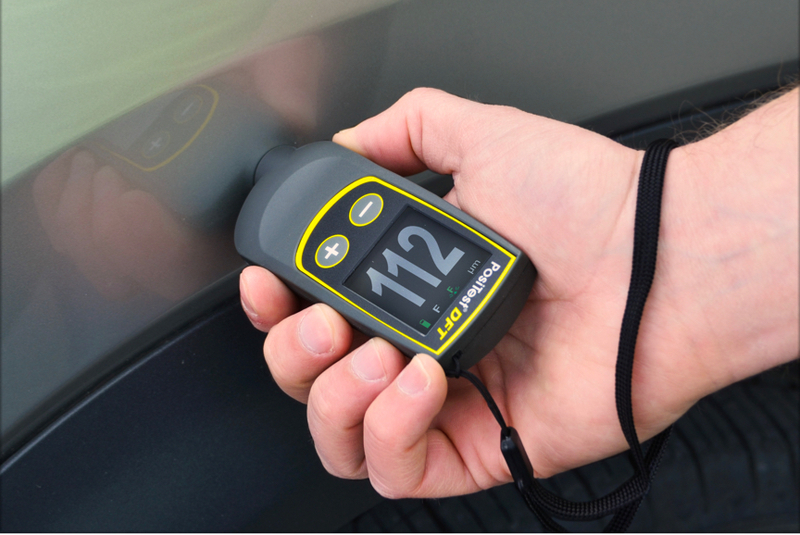 DeFelsko manufactures hand-held, non-destructive coating thickness gages that are ideal for use by automotive paint detailers. They enable full service detailers to quantitatively measure and control the amount of clear coat removed when sanding and buffing automotive paints. DeFelsko provides three options to this industry. 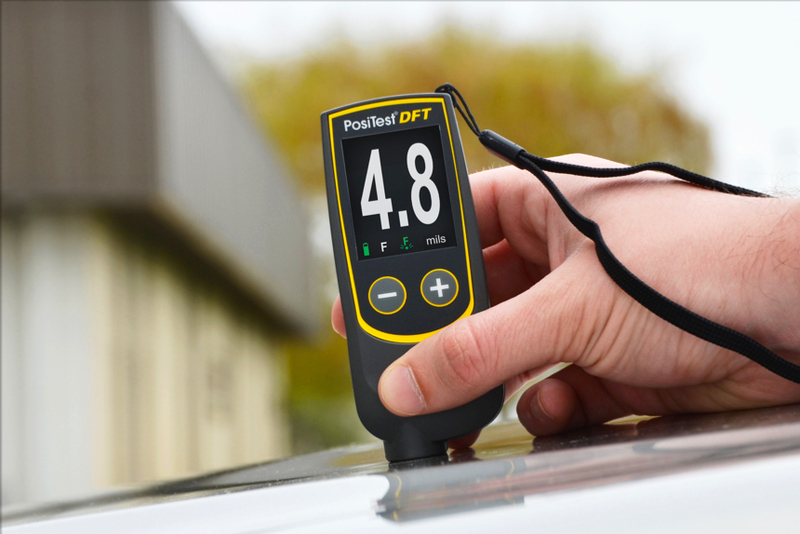 The PosiTest DFT is the economical and most common solution for measuring on exterior metal automobile panels. a. The PosiTest DFT-Ferrous for steel panels. b. The PosiTest DFT-Combo for both steel and aluminum panels. 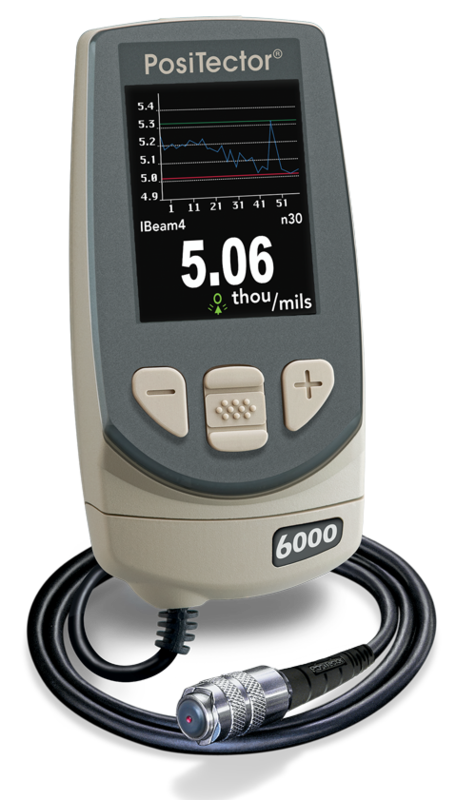 The PosiTector 6000 provides similar measurement capabilities with higher accuracy and resolution. Optional features include special probes, on-screen statistics, printer output and downloading to a computer. a. The PosiTector 6000 F1 for steel panels. b. The PosiTector 6000 FN1 for both steel and aluminum panels. 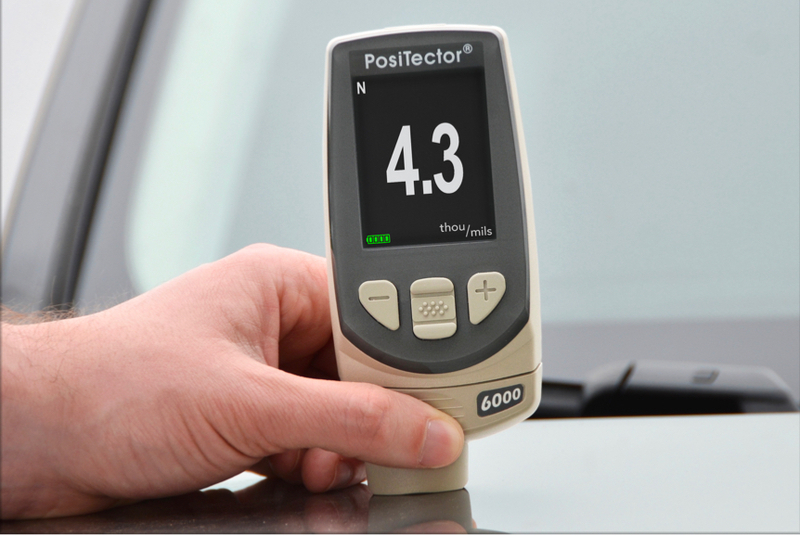 The PosiTector 200 has the unique ability to measure over non-metals such as automotive fiberglass or plastic. a. The PosiTector 200 B1 is the economical and most common solution for measuring the TOTAL thickness of the coating system. b. The PosiTector 200 B3 is capable of measuring both TOTAL coating thickness AND up to 3 individual layer thicknesses in a multi-layer system. Simple, affordable gage for total coating thickness measurement on metal panels. The PosiTest DFT series of gauges measure coatings up to 40 mils (1000 microns) making them ideal for non-destructive measurement of automotive paint thickness on a variety of metals. The PosiTest DFT Ferrous is ideal for measurements on steel panels, where as the PosiTest DFT Combo is available for measurement requirements on both steel and aluminum panels. 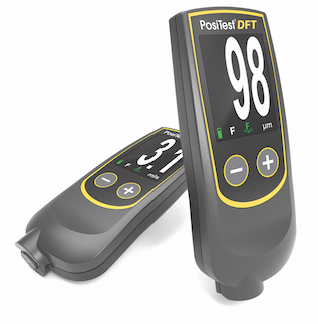 With +3% accuracy and a 0.1 mil (2 micron) resolution, the PosiTest DFT provides the capability to measure the amount of paint removed while sanding and buffing. Approved by major Dealer Equipment Programs such as Toyota, GM, BMW, Nissan, Volvo, Mercedes-Benz, Hyundai and Volkswagen. Product details are available here. Rugged, versatile gage for total coating thickness measurement on metal panels. The PosiTector 6000 series of gauges provide similar measurement capabilities with higher accuracy and resolution. Various probes are available with measuring ranges up to 25 or 500 mils (625 um – 13mm) and a selection of probes to measure various shapes. With +1% accuracy and a 0.05 mil (1 micron) resolution, these are among the most accurate instruments available. Additional features such as memory and print capability are also valuable to customers with a desire to log measurement results. Based on the intended application, customized gauges and probes are available that are specifically designed for measuring on steel, aluminum or both types of metal. These quality instruments are used in all aspects of automobile production, fleet inspection, and remarketing. Product details are available here. 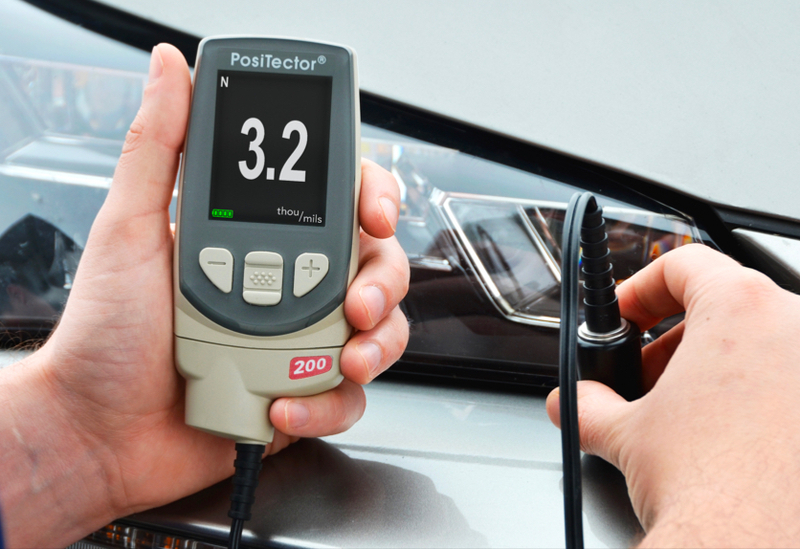 The PosiTector 200 ultrasonic gauge has the unique ability to measure over non-metals such as fiberglass panels, plastic bumpers and interior components. It has +3% accuracy and a 0.1 mil (2 micron) resolution. A simple gauge menu adjustment enables the operator to view the remaining amount of clear coat while polishing. Approved for use in BMW’s dealer equipment program. Product details are available here. Electronic magnetic gages are much more popular in the detailing industry. They use a constant pressure probe to provide consistent readings that are not influenced by different operators. Readings are shown on a liquid crystal display (LCD). While most have basic operation, some have options to store measurement results, perform instant analysis of readings, and output results to a printer or computer for further examination. Accuracy is typically between +1 to 3% with prices ranging between $300 and $1,000. It is relatively uncommon to find instruments that operate only with the eddy current principle in this industry. It is more likely to find gages that incorporate BOTH magnetic and eddy current principles into one unit. Some simplify the task of measuring by switching automatically from one principle of operation to the other, depending upon the substrate. These “combo” units are typically priced between $400 and $1,500. Place the probe FLAT on the surface to be measured. HOLD STEADY. When a valid measurement is calculated, the Gage BEEPS and the measurement is displayed. Lift probe at least 2 inches (5cm) from the surface between measurements - OR - leave probe on the surface in the same location for continuous measurements every 2 seconds. Do not drag the probe sideways on the surface. Measure an uncoated part. This quick zero-check determines if a calibration adjustment is needed for the particular object being measured. Next, lay the included plastic shims onto the bare surface and measure them individually to ensure the Gage can measure these known thicknesses within tolerance. Calibration Standards are available with greater accuracy priced between $95 and $345. Ultrasonic measurement of coating thickness works by sending an ultrasonic vibration into a coating using a probe with the assistance of a couplant applied to the surface. A bottle of a common glycol gel is included with every instrument. Alternatively, a drop of water can serve as couplant on smooth, horizontal surfaces. After a drop of couplant has been applied to the surface of the coated part, the probe is placed flat on the surface. Pressing down initiates a measurement. Lifting the probe when a double beep is heard or when the green indicator light blinks holds the last measurement on the LCD. A second reading may be taken at the same spot by continuing to hold the probe down on the surface. When finished, wipe the probe and the surface clean with a tissue or soft cloth. Measurement with an ultrasonic probe. Place the thumb and index finger low on the sliding sleeve. Press down to effect a measurement. Next, lay the included plastic shims onto a hard, smooth surface and measure them individually to ensure the Gage can measure these known thicknesses within tolerance. The terms “mil” and “micron” are units of measurement used by the paint industry to measure thickness. In the English system, a mil is a thousandth of an inch (i.e. 1 / 1,000th or 0.001” or 1.0 mil). The plating industry uses the term “thou” synonymously. In the metric system, a micron (um) is equal to one thousandth of a millimeter (i.e. 0.001 mm). What does a paint thickness gage measure? Paint thickness gauges simply measure or distance (height or gap) between the probe tip and the base metal. They make no distinction between the layers that make up that distance. Their thickness calculation includes the thickness of all layers (primer, base-color and clear coats), any repainted material, filler material, dirt, etc. Unless a measurement is taken before and after each layer has been applied, the user must estimate the thickness of each layer. 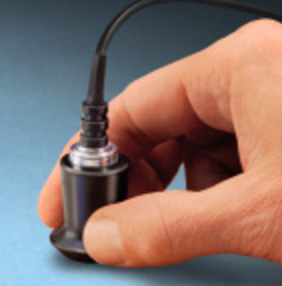 Ultrasonic gauges use an ultrasonic transducer to emit a high frequency sound pulse. The pulse travels into the coating via a coupling gel and reflects from ANY surface that is different in density. Coating thickness readings are obtained by measuring the time taken for the ultrasonic signal to propagate from the probe to the coating/substrate interface and back. The travel time is divided by two and multiplied by the velocity of sound in the coating to obtain the thickness of the coating. Ultrasonic models are available to either measure the total system thickness (like magnetic and eddy current gages) or the individual layer thicknesses in a multi-layer paint system. The affordable models are only intended for use over non-metal materials such as plastic. The clear coat is polyethylene paint without color pigmentation. Thickness usually ranges between 1.5 – 2.0 mils (35 – 50 microns). It is the final original equipment manufacturers coating applied to a vehicle to protect the (base) color coat from a hostile environment while providing both depth and a durable, glossy appearance. It is easily scratched and, once compromised, requires re-painting, as the base color has no shine or brilliance. Also, the clear coat provides UVR protection for the colored paint layer. Car manufacturers now specify that the paint thickness be measured before and after any wet sanding or buffing. Measurements should be taken regularly since it is virtually impossible to see how much paint is being removed during the buffing process. Using a paint thickness gauge gives a professional detailer credibility and also acts as an insurance against ‘break-though’ of a clear coat, which would entail a re-paint. What should the paint thickness be? Unfortunately there is no absolute target value – no “right” thickness. There are many different manufacturers making many different models with a wide variety of paint formulations and specifications. 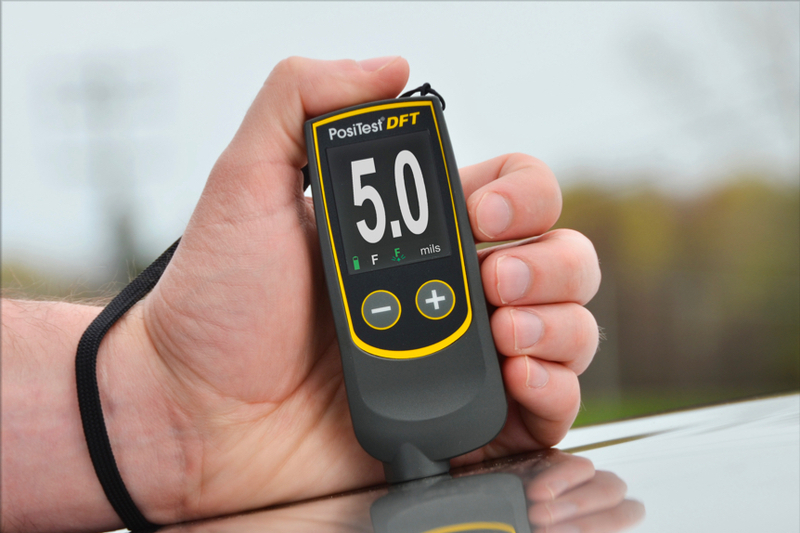 Some vehicles may only have 3 mils (75 microns) of total paint thickness on the roof, while some SUVs may have 17 mils (430 microns) on their rocker panels. Some vehicles are repainted at the factory when flaws are detected during manufacture. Typically however a vehicle from the factory will have between 4 – 7 mils (100 – 180 microns). Consistency is what is important. Measurements taken across a panel should show only small variations in thickness. Areas of reduced thickness may be a cause for concern. Areas of much greater thickness may indicate rework. If the instrument does not give a measurement it means that the thickness is over the gage’s limit and could mean the presence of filler and a likely repair. Are these instruments known by other names? Although most industries call them coating thickness gages, the automobile industry also uses names such as paint depth gauge, paintmeter, refinishing gauge, dry film thickness gage (DFT gages), paint thickness gage (PTG), mil gage, banana gage, spot checker, or paint gauge. Spelling is either American (gage) or British (gauge). What do F and N stand for on the display? Most instruments display the principle of operation used to take a measurement. “F” stands for ferrous metals (steel) and it means a magnetic principle was used to obtain the displayed measurement. “N” or “NF” or NFe” stands for non-ferrous metals (aluminum, copper, etc.) and it means an eddy current principle was used to obtain the displayed measurement. Where else in the auto industry are these instruments used? Detailers require a simple gage with good measuring accuracy and resolution to monitor the decreasing thickness of clear coat with buffing. But the same or similar instruments are used by body shops, dealerships, painters, appraisers, inspectors, and professional car buyers at auctions. Do I have to re-calibrate my meter often? The term “calibrate” is often miss-used. For a complete definition read this. Most people use the word to mean, “adjust to make accurate”. Quality meters automatically calibrate themselves regularly and usually require little input from the user except to RESET it if factory settings get modified, either deliberately or accidentally. All meters should be checked regularly for accuracy by measuring an uncoated piece of metal to ensure the gage reads “0”, and/or by measuring the included plastic shims when placed over uncoated metal. 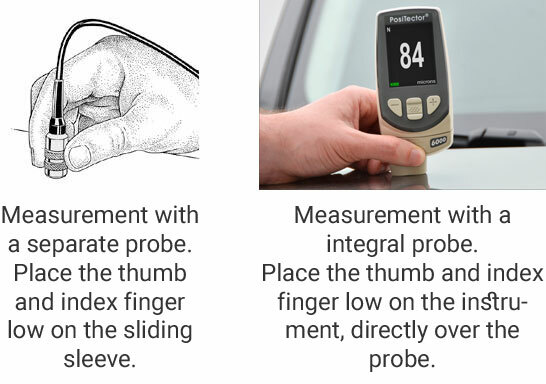 Cheaper, lower cost instruments “drift” and therefore should be checked before use each day. Their probe tips wear and their electronic components have wide operating tolerances. When they read in error, a one-point or two-point calibration adjustment by the user is necessary as described in the user manual. You get what you pay for. Will an ultrasonic gage measure over metal too? The answer is both yes and no. Yes the instrument will give good thickness results over metal. But no, the instrument is more expensive than metal gages, has less accuracy than many, and requires couplant (gel) when measuring. That’s why it is generally not recommended as a “do-all” instrument. Detailing as it relates to paint thickness measurement is the systematic cleaning, rejuvenating and protecting of the exterior painted surfaces of a vehicle. The primary purpose for paint detailing is to retain the appearance of newer vehicles or to revitalize older neglected vehicles. Cleaning is a preparatory step intended to remove dirt, dust, and other loose contaminants in order to allow full inspection of current paint conditions. 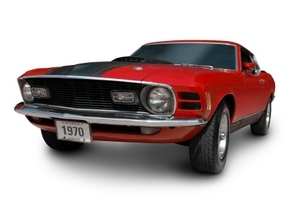 Rejuvenation refers to the processes used to return a vehicle to its original showroom condition. The extent of rejuvenation is dependent on the customer’s expectations. Protection refers to the maintenance processes such as waxing that are used to keep the vehicle looking new for as long as possible after detailing. Simple washing and waxing will not remove many types of surface paint damage; a rejuvenation step (polishing with an orbit or more effective high speed polisher) is added before the waxing step. When rejuvenation is required, detailers often polish the top clear coat layer of automotive paints to remove surface damage such as fine scratches, scuffs, swirl marks, oxidation, stains, paint overspray, tar, tree sap, acid rain or water spots. This polishing process is often referred to as finessing. Extensive paint problems may require the use of several sanding and buffing steps to bring the paint back closer to its original beauty.Automotive manufacturers typically use one of two main types of paint systems in their vehicles. The most common used today is a clear coat system in which a thin layer of color is applied, followed by multiple layers of clear non-pigmented paint. Used less frequently today is a single-stage paint system that consists of the application of multiple layers of pigmented paint. Since most detailing chemicals are designed to work on both paint systems, the paint detailing process does not significantly change based upon the type of paint system. To ensure consumer value and thus maintain profitability, there are two main considerations when justifying equipment and processes involved in the detailing process. Any added cost must result in improvements in either efficiency or effectiveness. While it could be argued that a detailer’s ability to take quick readings with a paint thickness gauge in order to determine the remaining paint thickness is an efficiency benefit, the primary benefit is the increase in effectiveness. When the need to polish (sand and buff) has been identified it is important to evaluate the paint in surrounding areas. Most factory paint jobs seem to range from 4 – 7 mils (100 – 180 microns). Thinner readings indicate that the clear coat is almost entirely removed or in the case of single-stage systems that the primer is about to show through. As represented in the photo above, thicker readings are often an indication that repainting has occurred. When repainting is detected, the operator has a difficult task in evaluating the suitability (thickness) of the top layer of paint for buffing. 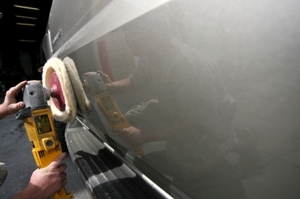 No matter how careful the operator, buffing or polishing on thin coatings risk paint damage to the vehicle. When detailing thin coatings or unknown paint layer thickness, an alternative system such as hand polishing may be the only safe option. After determining the paint system used on the vehicle and thus the expected paint thickness, it is important to determine the actual paint thickness. Even an experienced detailer finds it difficult to determine paint thickness, especially clear coat, through visual inspection. As thinner, more scratch resistant clear coats such as nano technology become more prevalent, it will become more critical to use high resolution electronic thickness gauge to determine how much paint thickness is being removed while finessing. Because of the potential for removing the majority of the UV blockers, most auto manufacturers recommend that a maximum of 0.3 mils (8 microns) clear coat be removed as prevention from UV damage to underlying paint layers. In a worst-case scenario with a single stage paint process, buffing down to the primer may result in a costly trip to the paint booth. Also consider that paint damage may not visually appear immediately. When too much topcoat is removed, premature failures such as fading or delamination may occur. Failures have the potential for lawsuits, unhappy customers and loss of reputation. Such risks can be alleviated by monitoring and minimizing the amount of topcoat removed, which is best done through quick and easy measurements with an electronic paint gauge. Significant damage below the top painted surface may include deep scratches, etching, staining, and heavy oxidation. Just as simple washing and waxing will not remove some top layer paint damage, rejuvenation through sanding and buffing may not be adequate for removing deeper paint damage. It is therefore important to recognize the limitations before too much paint has been removed. On some recently manufactured cars and trucks it is not uncommon to find all three materials – doors and fenders made of steel, roofs and hoods made of aluminum, bumpers and mirrors made of plastic.